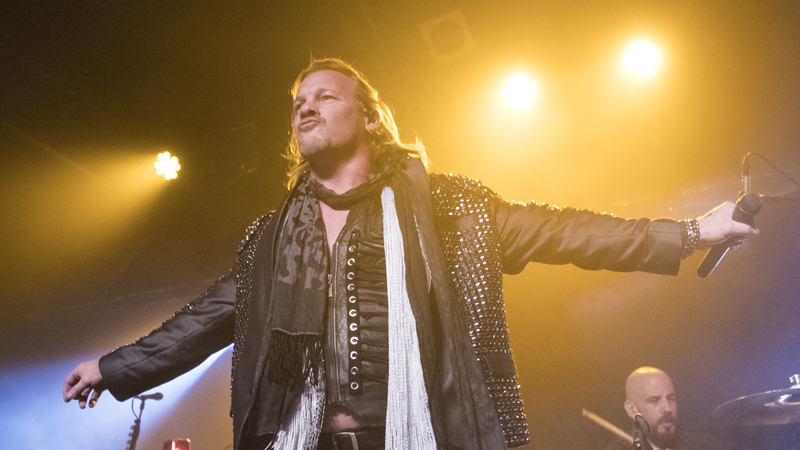 Chris Jericho returned with this week’s Talk Is Jericho and talked about what led him to signing with All Elite Wrestling. Jericho started by recapping some events from last week’s press rally, and commented on his WWE status now that he’s signed with another company. Jericho says he’s not going to be in the 2019 Royal Rumble match as a surprise, noting that he’s done that already in the past, but signing with AEW or not won’t change his status for that event, because he won’t be there. Jericho recaps his recent history with New Japan Pro-Wrestling, and says the attack at New Year’s Dash on Naito was a one-time deal, with room to make another deal later on down the road. He says he talked to Vince about it and later signed a three-match deal with New Japan. Jericho says he appeared on RAW 25 and wanted to stay backstage, then refers to his Greatest Royal Rumble appearance and says it is one of his top 8 paydays of all time. Jericho says the original plan was for the casket match with Undertaker, then he signed the New Japan deal, and got a less than favorable response from Vince. He says he realized he was pulled from that particular match because WWE wouldn’t give him a spotlight match if he was just going to leave for Japan and be seen on [what WWE might see as] a competitor’s show. Jericho talks about when he first heard about Tony Khan from his agent, Barry Bloom, and how he wanted to start a new promotion. Jericho says he considered a meeting, possibly using it for negotiations or advice. He says around this time he called the Asper family to ask them to hire Scott D’Amore and Don Callis for IMPACT Wrestling. He said it wasn’t because he was looking to go to IMPACT, but rather wanted the wrestling business to prosper. Jericho says Cody contacted him for All In, but said he could never do it due to his existing schedule. He talks about an idea pitched for the run-in during the Kenny Omega vs Pentagon Jr, and says Tony Khan’s jet was how he got to the event and back to his Fozzy gig. Jericho says a bit later on that month he had a four-hour meeting with Khan, citing his passion and experience in business and the NFL. Later, Jericho also said he did have a meeting with IMPACT and thought hard about it, and said IMPACT did make him a great offer, but Tony Khan came in with a bigger one. “I’ve been really impressed by IMPACT over the past year. I thought Don Callis and Scott D’Amore have really turned things around in that company. I really, really enjoy it, and I even thought long and hard about doing some shows there. I even had a meeting with Scott and Don in Toronto with Ed Nordholm; the offer they made was a great offer. That’s something funny, when I hear ‘all of these companies are vying for talent, free agents—WWE, AEW, New Japan, Ring Of Honor, MLW—dude, what about IMPACT? They’ve got money. They were going to spend some money on Chris Jericho. We had some great matches planned—Jericho versus Sami Callihan, Johnny Impact, Brian Cage—Rich Swann. I’d love to work with Rich Swann. Jericho says he put himself in ‘Chris Jericho 1998’s’ shoes when he thought of leaving WCW, relating the situation to today. He says he ultimately he went with AEW because they are showing him respect and they have a lot of expectations from him. He says with WWE, it’ll still be WWE no matter what he did there, but AEW needs his best so he can help build a company and be challenged as a wrestler. “Why wouldn’t I be? I’m WWE Alumni, I’m proud to be WWE alumni, but why would I still be on the WWE active roster of SmackDown? I’m not there any more. This is a three-year exclusive deal—with the exception of New Japan, which I still intend to work with, we don’t have anything set in stone, but we’re working on it—other than that, I’m not working anywhere else. I can’t contractually, nor would I want to. It’s AEW all the way. Jericho said his goals and ambitions changed, and he will miss WWE and Vince, but they need to take chances and always wanted to revamp his career.